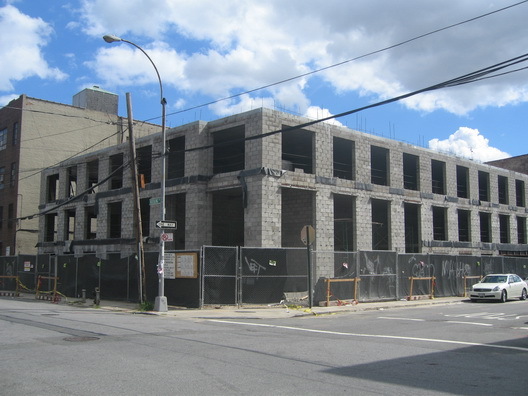 There are many Karl Fischer buildings rising on Roebling Street in Williamsburg. Well, actually, three currently in progress, one of which is the Roebling Oil Building at N. 11th and Roebling. This is his building at N. 8 and Roebling, 63 Roebling, which is diagonally across the street from a completed Fischer, on what we might call Karl Fischer Corner. It will end up at six stories. The interesting thing about 63 Roebling is that there was no excavation on the site for a basement, meaning that contractors only dug down a few feet before pouring a foundation.